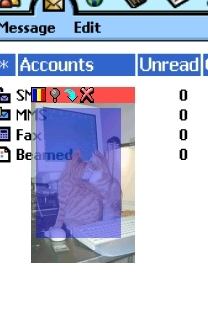 EZoom for the SonyEricsson P800/P900 (Symbian OS version 7) allows you to zoom in on the full screen of a P800/P900. EZoom works transparently for all applications apart from the camera viewfinder. Start & stop: Select start zooming from the menu to start zooming. To stop zooming either select stop zooming from the menu or press the close button from EZoom's control toolbar. 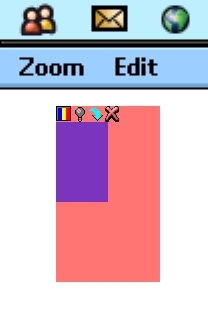 Zoom control: When EZoom is active it shows a zoom control. This control has a toolbar to change scaling quality, update mode and rotation and to stop zooming. 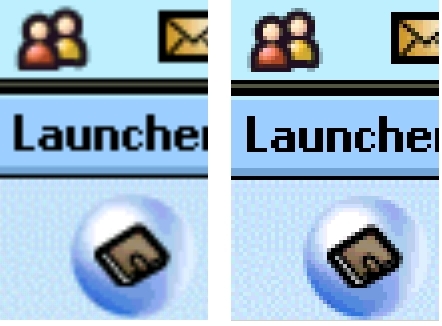 The zoom control shows the zoomed-in screen (the outer rectangle) and the area of that zoomed-in screen that is currently visible (the inner rectangle). The latter is drawn to scale and thus grows and shrinks as you zoom in and out. 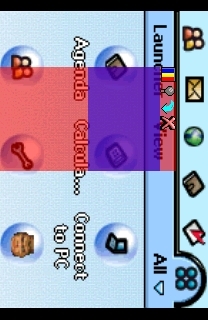 Dragging the inner rectangle moves around the visible area of the zoomed-in screen. Dragging the outer rectangle moves around the zoom control itself. The power button can be used to hide and show the zoom control. Change zoom: Use the camera button to zoom in and the browser button to zoom out. You can set the zoom level between 100% and 1600% with 25% increments. EZoom will give visual feedback on the current zoom level. Toolbar - quality: The 1st toolbar button can be used to toggle between high and low quality scaling mode. For those who care, high quality mode uses a bi-linear scaling algorithm; low quality uses next-neighbour scaling. Toolbar - update mode: The 2nd toolbar button toggles between smart update and continuous update mode. In smart update mode, EZoom will only scale parts of the screen when they get redrawn by the system (good for battery life and excellent performance); in continuous update mode, EZoom will scale the entire screen 15 times a second (bad for battery life and bad performance). Smart update mode works fine in most cases but some applications will require continuous update mode, particularly games like EDoom & EMame. Toolbar - rotation: The 3rd toolbar button will rotate the screen 90 degrees. There is no additional performance penalty in doing this. Transparency: Under the options menu you can configure the zoom control's transparency level. 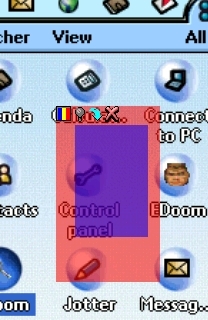 Background image: Under the options menu you can configure the zoom control's background image. Latest version of Zoom for the P800/P900 is 1.1. Download the .SIS file and install it on the P800/P900 as per normal. Fixed cosmetic bug where screen updates can become flickery (especially the blinking cursor) when stopping/closing EZoom. Latest source code is released under the GNU General Public License (GPL). Read the sources.txt file in the docs folder for build instructions. EZoom works in both flip open and flip closed but I haven't made a real effort to make the flip closed support fully functional. Note that on a P800 the touch screen is enabled in flip closed, so you can actually use the stylus to control EZoom. On a P900, the touch screen is always disabled in flip closed. 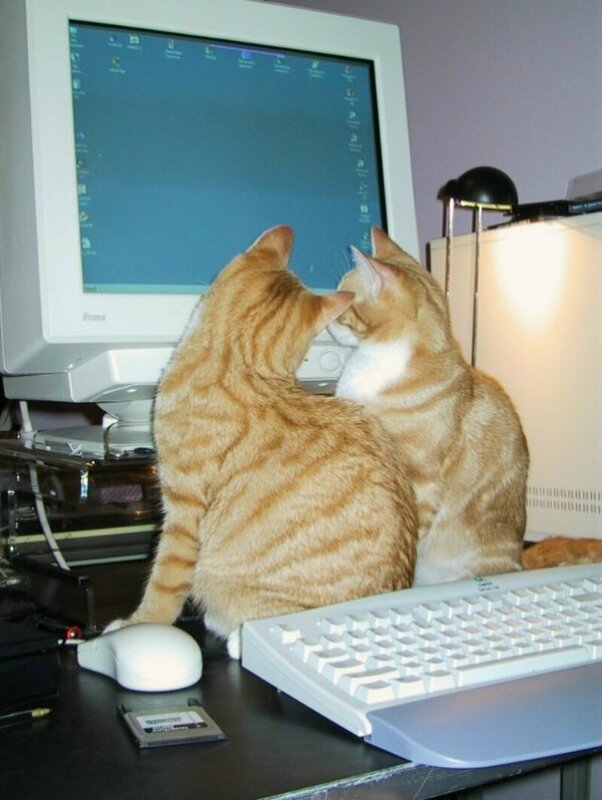 When EZoom is active it will prevent the system from turning off the display otherwise the screen gets corrupt. A side effect of that is the the backlight will never be changed either when EZoom is active. I've written an article on EZoom for Symbian's Developer Network.